Lin Hong, born in China, began to play the piano at the age of six. By age nine, his talent made him one of seven students in all of China to be accepted by the Shanghai Conservatory of Music. Mr. Lin received a full scholarship for the Sophia Guzik and the American Youth Symphony awards at UCLA. During this time, he furthered his studies for several years under the legendary Master, Johanna Harris and in 1991 he became an Artist-in-Residence at San Diego Mesa College. Mr. Lin received a Full Scholarship to attend the Aspen Summer Festival after winning a Musical Merit Foundation Competition. It was at this time that the renowned John Perry heard him play and invited Mr. Lin Hong to attend the USC School of Music, where he graduated with honors. At age 17 studying in California Lin won the Grand Prize of the San Diego Symphony Young Artist Competition, gave three performances at San Diego Copley Symphony Hall under the baton of Murry Sidlin and toured throughout Southern California and Mexico with the La Jolla Symphony Orchestra. He was also the winner of several international piano competitions, which included the lgor Stravinsky, Joanna Hodges and the First UCLA International Piano Competitions. Since then, Lin Hong has given numerous performances throughout Southern California includes a recent appearance in 'The Night Honor Israel' at the Ambassador Auditorium in Pasadena. Mr. Lin received his Master of Music with a full scholarship at the Juilliard School, where he continued working with Margo Garrett, Marshall Williamson and Martin Canin. In 2001, Mr. Lin was invited by the USC School of Music as the official pianist for the master classes of Janos Starker, Ralph Kirshbaum, Steven Isserlis, Luis Claret and Boris Pergameschikow... Mr. Lin was also given the honor of joining The Juilliard School and the Leipzig Musik Hochschule for the Chamber Music program in Leipzig, Germany. Other European appearances included the Salzburg Iceland National TV. The IBLA International Piano Festival in Sicily, Italy and the Chamber Music concerts at the Music Festival in Nice, France. For the past, Mr. Lin were invited by the Chinese government to given concerts tour in several major cities in China. His performances and interviews were broadcasted on the China national TV. His performance of Bright Sheng's composition:" My Song" was interviewed by the Voice of America. 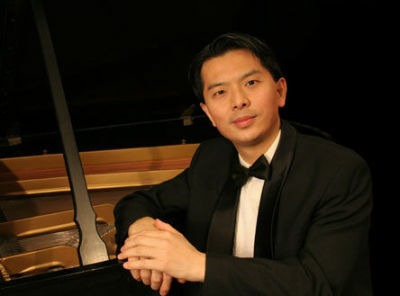 In New York, Lin Hong has given solo and chamber music recitals at Carnegie Recital Hall, Alice Tully Hall, Paul Hall, Water Reader Theatre, Lincoln Center Theater, The Juilliard School, NYU, Columbia University among others...His concert appearance at The Festival of the Hamptons directed by Lukas Foss received highly critical acclaim. In March'06, his Juilliard based piano trio:' The Auden Trio' was represented by the Juilliard Chamber Series at Alice Tully Hall for the celebrating 100 years of the Juilliard School. His performance with cellist Hai Ye-Ni ( The Principal cellist of the Philadelphia Orchestra) was recorded and broadcast for the National Public Radio. Since 2008, The International Piano Festival and Academy of the Shanghai Conservatory of Music appointed Mr. Lin Hong as the Artistic Advisor in New York. The Olympic concert committee of Beijing invited him as the Program Executive and the U.S. coordinator for the Beijing'08 Olympic event " Centenary Piano Extravaganza" project at the National Center for the Performing Arts, Beijing. Mr. Lin is also the visiting professor at the Fujian Conservatory and Sichuan Conservatory of Music in China.